For the last nine months, a team of four at Hello Games has been working hard on something called "Project Skyscraper," which we now know as No Man's Sky – the upcoming first-person sci-fi exploration game revealed during the VGX video game awards show this past weekend. It was one of the bigger, more interesting, surprises of the show. And Hello Games managing director Sean Murray is quite ecstatic to be able to finally talk about the studio's ambitious new universe. No Man's Sky is what Murray describes as true sci-fi. It's all about exploration and discovery, as opposed to the space marine-filled, war-torn dystopia that sci-fi fantasy video games have been highlighting for years. No Man's Sky draws inspiration from classic sci-fi sensibilities. "It's what I grew up with, actual science fiction, in books. Stuff from Asimov, Clarke, Heinlein and stuff like that. And that is fantastical - it's vibrant, exciting and the unexplored. It's mysterious. That's the world we want to create." 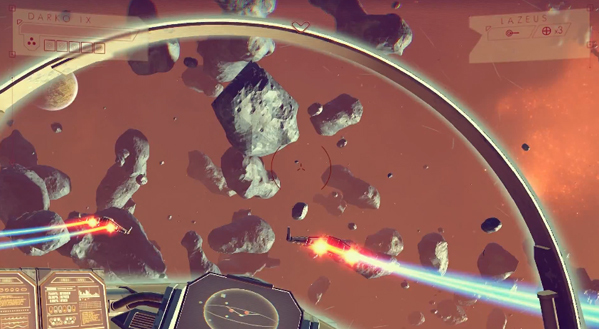 Exploration will naturally play a big part of No Man's Sky, which will feature a universe of procedurally-generated planets that players can freely explore at any time. "We want to make a game about exploration and when I say that, it's kind of a bad word. It's ambient – a passiveness – but the kind of sci-fi we want is exploration filled with danger. The universe is adversarial; it's like a scary, difficult place to be and you're quite vulnerable in it. We want to create that sense of true exploration." Murray says that if you're standing on a planet in No Man's Sky and see a mountain in the distance, you'll be able to walk to that mountain and climb it. If you're standing on a planet and you can see another planet on the horizon, it's a real place with real features – and you can "get in your ship and fly there seamlessly." "Everyone that plays will play one consistent universe. Normally with a roguelike, you'd play through and every time it's different. With this, everybody starts on a different part of the universe but it is the same consistent universe for all players," Murray said. "There are things you can do that have significance and those things are shared for everyone. You are not the hero of this universe; you are a person in it – or a being, a player in it. And you make decisions all of the time as you go through it. You start on the outside of the universe, and everyone does, and for a lot of people that roguelike structure will be trying to get to the center of the universe." In terms of actual gameplay – which the announcement trailer was pretty light on – space battles and first-person shooting are some of the core gameplay elements, so No Man's Sky "isn't an ambient experience." Murray added that Hello games is purposely not trying to show off much in terms of gameplay right now because it wants to "get out what's different about the game" rather than have players make comparisons to established experiences. For Murray and his colleagues, it's more important that Hello Games pushes what makes the game unique – the thrill of exploration and discovery. Other players will help in exploration, too. A galactic map – visible to all players – will document planets and regions to visit, both discovered and unexplored, for all players. Upon visiting an undiscovered location, players may then choose to share that information with others through the galactic map – or not. Murray likens it to the crafting in Minecraft, where some players would purposely choose not to share formulas with other players. So you can have as little or as great an affect on the universe for other players as you see fit. "The game will be in a state of flux and I think that makes it really exciting. You can get that real feeling of discovery that you haven't had in a game before. And that's interesting, because we won't have seen everything in the game when it releases – not by a long, long shot." Murray didn't want to give too much away but was clearly very excited to finally announce No Man's Sky and talk about it. "The game, right now, runs on off-the-shelf high-end PC and it runs on a next-gen console." Murray wouldn't disclose anything else about platforms but did say development of No Man's Sky is "further along than what the trailer would lead you to believe."